This post is sponsored by Gourmesso. All opinions are my own. With the temperatures now dropping, it’s nice to enjoy a hot cup of coffee and a little treat to dip into that coffee. That treat is Gourmesso coffee with Cranberry Orange Pistachio Biscotti. I was contacted by Gourmesso to sample of a range of their coffee and espresso. Gourmesso are the leading providers of coffee and espresso capsules in Europe that are compatible with Nespresso®* machines and it’s so exciting that they have recently entered the U.S. market. For more information on their coffees, visit Gourmesso.com. Are you familiar with Nespresso®*? You may have seen their TV commercials featuring George Clooney they are so funny and entertaining. If you have not seen them, check them out here at Bon Appetit, as well some other fun facts about George’s coffee drinking habits. It’s a good read, especially while enjoying a good cup of coffee. Being British, we tend to enjoy tea in the morning and coffee as an afternoon pick-me-up. Now that I live in the U.S and married to a coffee loving American, I’ve started to enjoy coffee more and more in the mornings, but also still enjoy a cup in the afternoons as well. You can never have too much of a good thing. Sometimes, tea just needs to take a back seat, but there are always times to fit in a comforting cup of tea. I don’t drink a lot of coffee, 1 or 2 cups per day is good enough for me. How one takes their coffee is a very personal thing. I like to let the flavor of coffee shine, so I prefer to take my coffee with no sugar and just a touch of cream. How do you take your coffee? If you’re not familiar with biscotti, they are an Italian cookie that are very different to other cookies because they get baked twice. The dough is formed into a ‘log’ shape then baked until just golden brown. This log is then sliced into the familiar shaped cookies then baked again to obtain the ultimate crunch. They are traditionally made with almonds but you can pretty much add whatever ingredients you choose and they always turn out delicious. Do you dip your biscotti in coffee? While enjoying a warming cup of coffee, I love nothing better than a little sweet treat if you will, to dip into the coffee. We all like dipping (or dunking). Whatever you call it we all deserve a treat when enjoying the most popular beverage in the world. These Cranberry Orange Pistachio Biscotti are the perfect seasonal cookie to enjoy with coffee and are so easy to make. 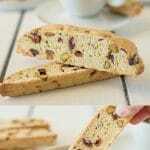 What I love about biscotti is their characteristic crunch. Dip them into a good cup of coffee, which is usually how they are served, they soak in the coffee flavor and where they don’t fall apart like regular cookies do, they soak up just enough for a delicious and satisfying bite. When deciding what flavors to add to the biscotti, I went with cranberry, orange and pistachio as they are all ingredients you find around this time of the year and orange pairs so well with coffee (for the dipping taste sensation I was talking about). 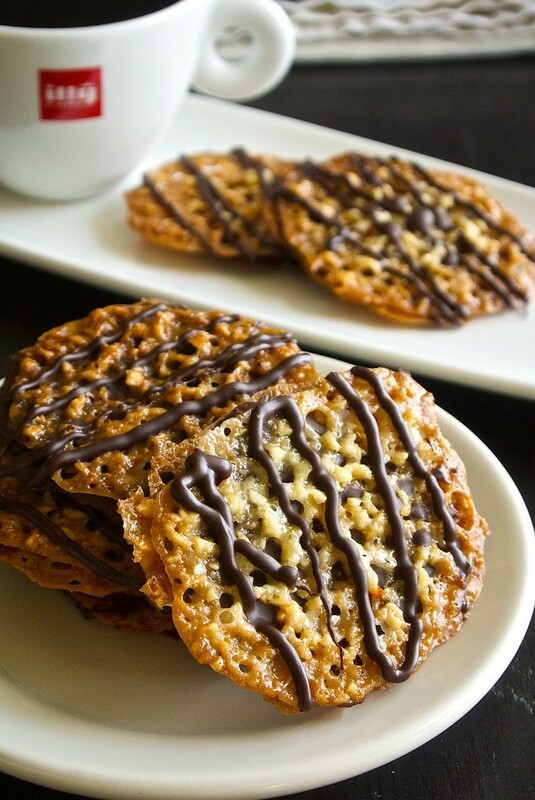 Another favorite cookie of mine to enjoy with coffee or espresso are Florentine cookies. They also hold up well to coffee dipping. They are a crunchy, almond cookie sandwiched with chocolate and nothing goes better with coffee than chocolate. How long can you keep fresh biscotti? Stored in a sealed container, in a cool dry place away from direct sunlight, biscotti can be kept for up to 6 weeks. If you’ve tried these Cranberry Orange Pistachio Biscotti or any other recipe on the blog then don’t forget to rate the recipe and let me know how you got on in the comments below. I love to hear from my readers! You can also FOLLOW ME on FACEBOOK, TWITTER, INSTAGRAM and PINTEREST to see daily recipe updates. Cranberry orange pistachio biscotti. A crispy, twice baked Italian cookie studded with dried cranberries, pistachios and scented with orange. Preheat oven to 350 F with rack in the center of the oven. Line a baking sheet with parchment paper. Add the flour, baking powder and salt to a bowl, stir to mix. To a separate bowl (or stand mixer) add the eggs and sugar. Beat until about 3 minutes until pale yellow. Add the flour mixture, pistachios and cranberries, vanilla and orange zest. Mix until combined. The dough will be sticky, allow to rest for 5 minutes. Using wet hands, form the dough into a mound on the prepared baking sheet. Bake for 30 minutes until a little browned. Remove from the oven and allow to cool for 10 minutes. Using a serrated knife, cut the dough into ¾ inch thick slices. Place them back onto the baking sheet and bake for 25 minutes until crisp. I love my Nespresso and need to find this coffee and also make these biscotti.